The deployment of RFID technologies has been picking up in environments such as warehouse operation, logistics, manufacturing, and retailing industries. UHF RFID systems are getting more attention due to the benefits it could generate and the improvement that has been made. CipherLab USA, a global leader in the design, manufacture, and marketing of Automatic Identification and Data Capture/Collection products and systems, will showcase its latest line of Bluetooth® UHF RFID reader and mobile computers devices at the RFID Journal LIVE 2018 event at Orange County Convention Center, Orlando, FL. booth # 1532 from April 10-12. CipherLab will introduce the 1862 Handheld Bluetooth RFID Reader designed to address the growing demand for UHF RFID applications in warehouse, logistics, manufacturing, healthcare, and retail operations. CipherLab 1862 UHF RFID handheld reader has a long reading range of 16.5 ft. which makes data collection easier from the ground. Users can also easily reach and collect data from hard to reach locations. On top of that, the data collection process is made simple with the ability to read manifold and various EPC Gen 2 (ISO 18000-6C) tags at one shot. CipherLab’s 1860 series’ high performance RFID technology makes applications such as asset management and item level tagging quick and easy. “The deployment of RFID technologies has been picking up in environments such as warehouse operation, logistics, manufacturing, and retailing industries. UHF RFID systems are getting more attention due to the benefits it could generate and the improvement that has been made. We aim to fulfil as many needs and expand our products to better serve our customers.” commented by Luis Wu, Vice President and General Manager of CipherLab USA. CipherLab 1862 RFID handheld reader has made RFID data collections easy and efficient with its powerful RFID reader function. 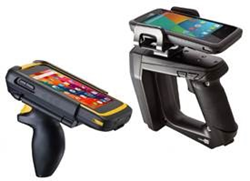 CipherLab 1860 series further sets itself apart with its ability to extend its RFID reading and writing capabilities to existing mobile devices through its Bluetooth® pairing. The 1860 series enables versatile data collection with Bluetooth® pairing while the 1862 also includes Bluetooth® V4.0 dual mode which is backward compatible with current and future smart devices. This conveniently allows users to have no worries of high replacement costs for their existing mobile device investments. The 1860 series handheld reader’s compatibility provides the ultimate investment assurance for its users. For more details and specifications regarding CipherLab 1862 Handheld UHF RFID Reader or other CipherLab products, please send an email to NASales(at)cipherlab(dot)com or contact our office at 888-300-9779.